NASA said its Hubble Space Telescope has detected subtle traces of water in the atmospheres of five distant alien worlds. Two teams of scientists have discovered faint signatures of water in the atmospheres of five exoplanets. This is the first study to conclusively measure and compare the profiles and intensities of these signatures on multiple worlds. Scientist use space telescopes like Hubble to not only spot exoplanets, but also analyze their atmospheres. As a planet passes between its star and the Earth, researchers are able to analyze the atmosphere by determining which wavelengths of the star’s light are transmitted and which are partially absorbed. During the latest study, the scientists used Hubble’s high-performance Wide Field Camera 3, which is one of a few cameras capable of looking into the atmospheres of exoplanets trillions of miles away. Observations were made in a range of infrared wavelengths where the water signature would appear. The teams compared the shapes and intensities of the absorption profiles, and the consistency of the signatures helped confirm they saw water. 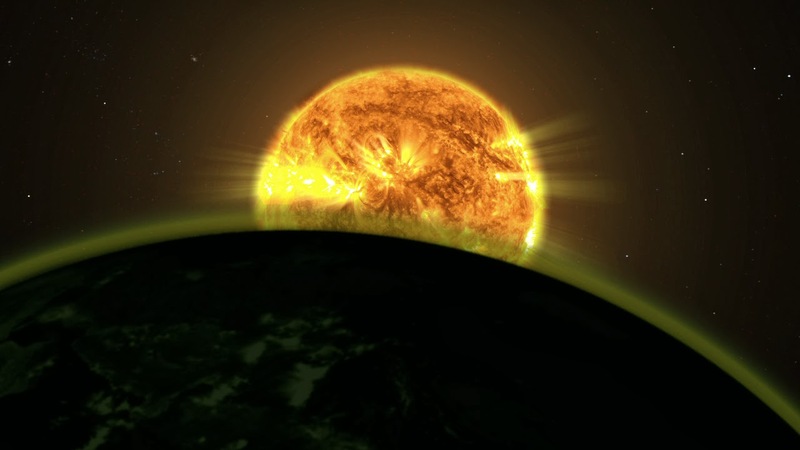 “To actually detect the atmosphere of an exoplanet is extraordinarily difficult. But we were able to pull out a very clear signal, and it is water,” L. Drake Deming of the University of Maryland in College Park, whose team reported results in the same journal, said in a statement. The team said the water signals were less pronounced than expected, which could be due to a layer of haze or dust blanketing each of the five planets. This haze can reduce the intensity of all signals from the atmosphere in the same way fog can make colors in a photograph appear muted. Haze also alters the profiles of water signals and other important molecules in a distinctive way. The five planets in the study, WASP-17b, HD209458b, WASP-12b, WASP-19b and XO-1b, all orbit nearby stars. They are all hot Jupiters, which are massive worlds that orbit close to their host stars. WASP-17b, a planet with an especially puffed-up atmosphere, and HD209458b had the strongest water signals. The scientists were initially surprised to find all the planets were hazy, but some team members noted that other researchers are finding evidence of haze around exoplanets. Now read: Hubble discovers the first blue planet outside the Solar System.